Global Beats & Irie Heights present a seminal event - Roger Steffens and John Masouri - two of the world's most acclaimed reggae writers in conversation for two-hours of unique insights into the life and times of Bob Marley and the Wailers. The show includes rare and unreleased film and audio recordings of Marley, plus anecdotes and insights drawn from the speakers’ own experiences and knowledge of Jamaica, it's music and culture. 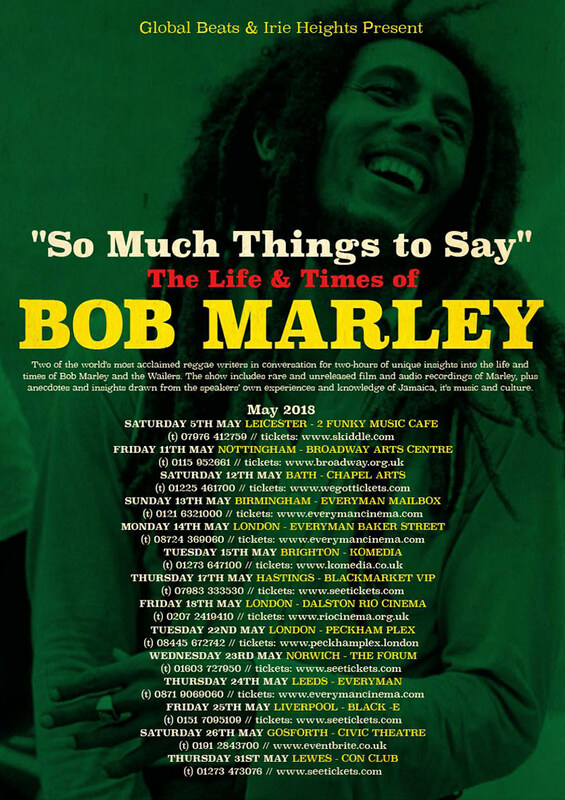 Both have made regular trips to Kingston and written extensively on Bob Marley and The Wailers, charting their lives and legacy in numerous articles and books. Chris Blackwell, founder of Island Records stated that “Roger Steffens has done more to preserve the myth of Bob Marley than anyone in the world”, whilst David Rodigan described John Masouri as "the world's foremost reggae journalist". Each show is scheduled to last two hours. This includes a short intermission around the halfway mark, followed by a Q & A session. Both authors will then sign copies of their latest books. JOHN MASOURI is a British author, journalist, reviewer and research consultant specialising in reggae music. As a journalist with Echoes Magazine, he’s written about reggae music in all its forms for almost thirty years and interviewed many of its greatest and most influential figures, from ska and sound-system giants of the 60s to current hit-makers Chronixx and Vybz Kartel.